Atlapac is located in the nation’s heartland, within a 500 mile radius of half the population of the United States, which provides direct access to the flexible packaging you need, when you need it. 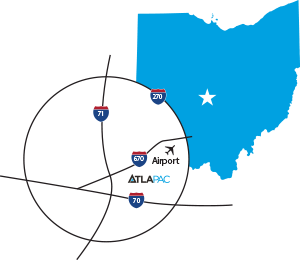 Atlapac is located 7 minutes away from Port Columbus International Airport & within 5 miles from the intersection of I-70 & I-71. 6.Travel on Cassady for 100 yards, enter industrial park on your left (Look for a company named Bartha). 7. Travel into the industrial park (you are on Fourth now) 0.5 miles until you see Atlapac - Building #1.